Get a better picture – load test the cloud. Load testing is never finished. I’ve spent a good couple of days testing something only to find it slow down when in production, so when do you decide: “That’s it. Ship it”? Is there something lurking in there that’s going to hurt you on the first day in production? Too often, I’ve seen people get hung up on one or two load times as an indicator of their entire app, so here I’m going to look first at those numbers and then I’ll look at using a curve to describe your app’s performance. Things always look better when they have a graph, don’t they? In this post, I’m going to stop short of testing POST requests and interaction through lots of screens – that will be for another day. This time, I’ll look at thinking beyond the load time on a couple of screens to viewing the range of page performance your users get. Here’s the scene: You have an app ready to ship and you want to know how it’ll behave when it gets the 2 million hits the marketing guy is sure it deserves. To do this, you work out what the peak number of concurrent users will be and blast it with that number. A tool like siege creates a set number of requests in one of a few modes. By default, it behaves like a normal user, delaying between hits, but it can also be set to benchmark the site by not delaying between hits. Now don’t fall into the trap of measuring everything with one number. Don’t look at the Availability line and think a number near 100 percent means everything is fine. It isn’t. You need to look at the outliers, the longest transaction, failed transactions, and unavailability to find out how bad it’ll be for some users. For example, if your app’s page relies on five hits on the web stack (assuming you pushed all static assets to S3 or something static), the probability that each user is affected by a 1 percent failure rate (i.e., 100 percent minus availability) increases because scaling that 1 percent of failed hits doesn’t mean just 1 percent of users. So, how do you find out what it’s like for more users? Some other basic options you should use are -t, which sets the time your site is put under siege. Don’t skimp on this because apps behave different after a prolonged battering, as caches build up and the cache system misses more than it hits. Run it for a good 20 or 30 minutes and see what starts to melt first. For debugging --get should be used. This works like --save-headers in wget, so you can make sure you’re getting back what you expect. Don’t assume short response means everything is completely fine. It has to be the right kind of response. A brilliant “gotcha” I’ve seen is someone benchmarking a server that is spitting out 404s like there’s no tomorrow because the app crashed after 20 concurrent hits. So, that’s a few users, some URLs and some post data. Now I’ll take it up a notch. The -b option benchmarks the server. There’s no delay between hits on the server so the only limit is your computer’s memory and connection to the web. Unfortunately, they can be limiting, so how can you create a really good benchmark? You need a microarmy. Before this was written and in the days before AWS, you would grab all the servers you could from various data centers and batter each server. Then, when AWS came about, you’d spin up a dozen servers and use Capistrano to attack your little cluster. If you are planning to plot the results, you almost certainly don’t want to write down the results each time. The siege log by default is held in /usr/local/var/siege.log and contains all the data recorded on each of the tests run. Of course, you can copy this into a Google doc or a spreadsheet to give yourself a nice-looking graph. I used siege for a long time but then found I wasn’t getting a real picture of the end-user’s experience. I was looking at availability with fewer than 200 concurrent benchmark users and thinking, “looks good for most hits.” I needed a more detailed picture of what was happening for the users. I was doing exactly what I started talking about: using one number to describe the experience of a wide range of users. A heap of options are offered with ab, such as outputting results to a CSV file and adding arbitrary headers. Once you issue this command, you get output similar to siege, but it gives you a very useful result on how many were served and in what percentile. Web users are looking for consistency, so you should expect most of the responses to be around the same time. If you have too much variation over too large a time difference, your site will look erratic. Everything on websites is about consistency. If you can be consistent at one second, then do so if the alternative is 20 percent of users getting under a second and the rest getting 10 seconds. Unlike taking an average, which can be heavily skewed toward lots of good results and hide a couple of really bad ones, this gives you the data for each percentile. So, although the first 1 percent of response times might be a snappy 500ms, if the top 1 percent is more than 10 seconds, you can see something to worry about. This is especially true for complex apps that use several Ajax requests or web sockets, in which case one in 50 connections being slow could end up affecting more users. The lower the point at which the response times increase rapidly, the more worrying because this means more of your users are seeing a slow site. This can tell you much more about the behavior of your app than the response rate maximum load time. 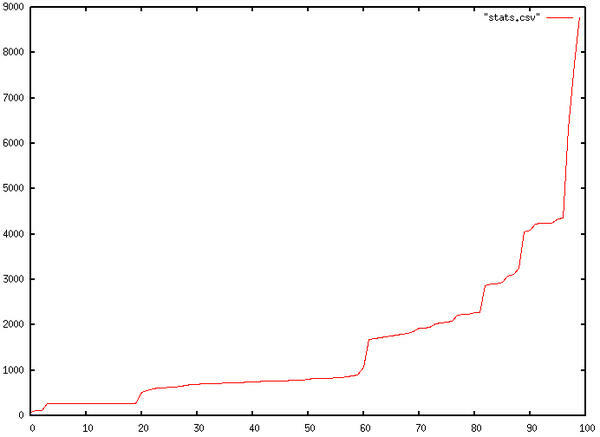 Figure 1: CSV file from ab -e in gnuplot. Figure 1 is an example with response times on the y-axis and percentiles of users on the x-axis. You can see the response times climbing slowly and then rocketing as the server isn’t able to deliver the responses. Finally, when you reach a certain point, you hit the limit at which the server is simply not available. With this chart, you can run some really interesting tests and get some telling data out out of the system. Increasing the number of current users (the -n flag) step by step gives you a series of graphs of the performance behavior of your app. So now, instead of one number saying 95 percent of hits will be OK, you can see the behavior changing as the number of users increases. Instead of picking a random concurrency number to benchmark, you can find the problem points and tackle them. Now I’ll bring all this back to the cloud. When you’re designing and testing your cloud architecture, you need to consider failure and the effect of failure. Load testing isn’t just seeing how much traffic you can cope with but seeing how much traffic a degraded cluster can cope with. What happens if you kill half the web heads but the load stays the same? By plotting the response times rather than taking a single number and by gradually changing the number of concurrent users, you get a much better picture of what your users will be writing on Facebook when your site slows down. And, you get to redesign your cloud architecture as if you’d already suffered the failure.